Tired of looking in the mirror and seeing hollow, sagging cheeks? Juvéderm Voluma™ XC, is a filler specially designed to restore fullness to the cheeks. Juvéderm Voluma™ XC is a new facial filler available in the Juvéderm ® family of hyaluronic acid fillers. The first of its kind, Juvéderm Voluma™ XC is specifically made to restore age-related volume loss in the cheeks. The signs of aging aren't limited to wrinkles. In fact, a key (yet less frequently discussed) sign of aging is loss of fullness in the cheeks. Full cheeks are a key marker of youth. Age-related volume loss can cause the face to lose definition, balance and change shape, all of which can make a person appear older than their years. Loss of fullness can be a challenge to correct, with limited surgical and non-surgical solutions available. Fortunately, Juvéderm Voluma™ XC is specially formulated to restore facial volume lost over time. Using the latest in volumizing technology, Juvéderm Voluma™ XC proves that a little volume can go a long way in restoring a more youthful, natural appearance. How does Juvéderm Voluma™ XC work? Juvéderm Voluma™ XC uses hyaluronic acid, a sugar that occurs naturally in your skin, to instantly restore lost facial volume in the cheeks. Juvéderm Voluma™ XC also combines with collagen and elastin to improve skin structure and elasticity, and create a smooth natural look. The results are instant, natural looking and can last up to 18 months.1 Plus there's no downtime – most people resume normal activities immediately. What is Juvéderm Voluma™ XC indicated for? Mid-face: restore deep volume loss and smooth the mid-face. Cheeks: rejuvenate sunken areas around the cheeks. How is Juvéderm Voluma™ XC different from other Juvéderm ® facial fillers? Voluma™ XC is different than Juvéderm ® Ultra, Juvéderm ® Ultra Plus, and Juvéderm ® XC because it works on a different area of the face. Other Juvéderm ® fillers smooth out moderate to severe wrinkles and folds around the nose and mouth, like parentheses. 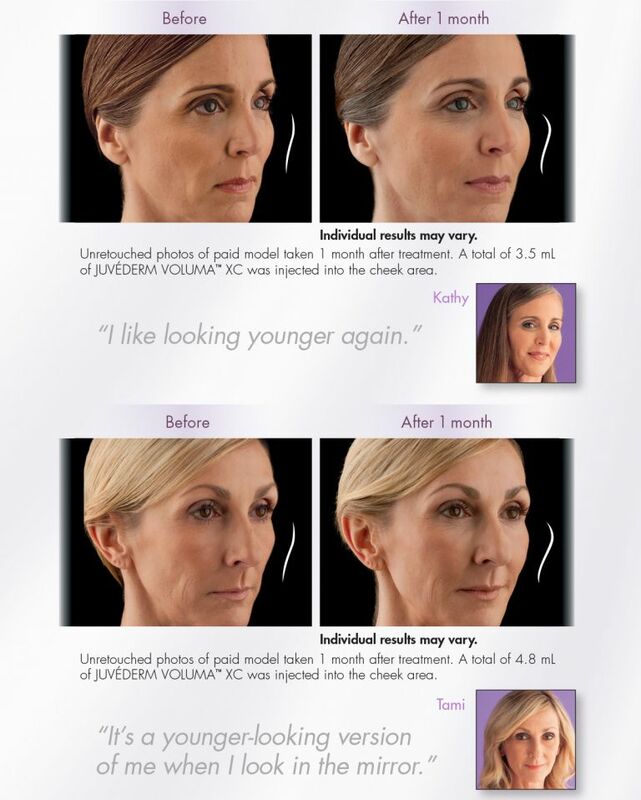 Voluma™ XC adds volume to the cheek and mid-face areas. What else should you know about Juvéderm Voluma™ XC? It is the first and only Hyaluronic Acid (HA) filler FDA-approved to instantly add volume to the cheek area, resulting in a subtle lift. Juvéderm Voluma™ XC is from the makers of the #1 family of fillers and clinically proven to last up to 2 years with optimal treatment. After 24 hours, you should be able to resume your normal activities. Side effects are moderate and generally last 2 to 4 weeks. Common side effects include temporary reactions at the treatment site such as tenderness, swelling, firmness, lumps/bumps, bruising, pain, redness, discoloration, and itching. Call Dr. Roth's office at (702) 450-0777 to make an appointment or learn more about our special offer for Juvéderm and Juvéderm Voluma™ XC treatments. 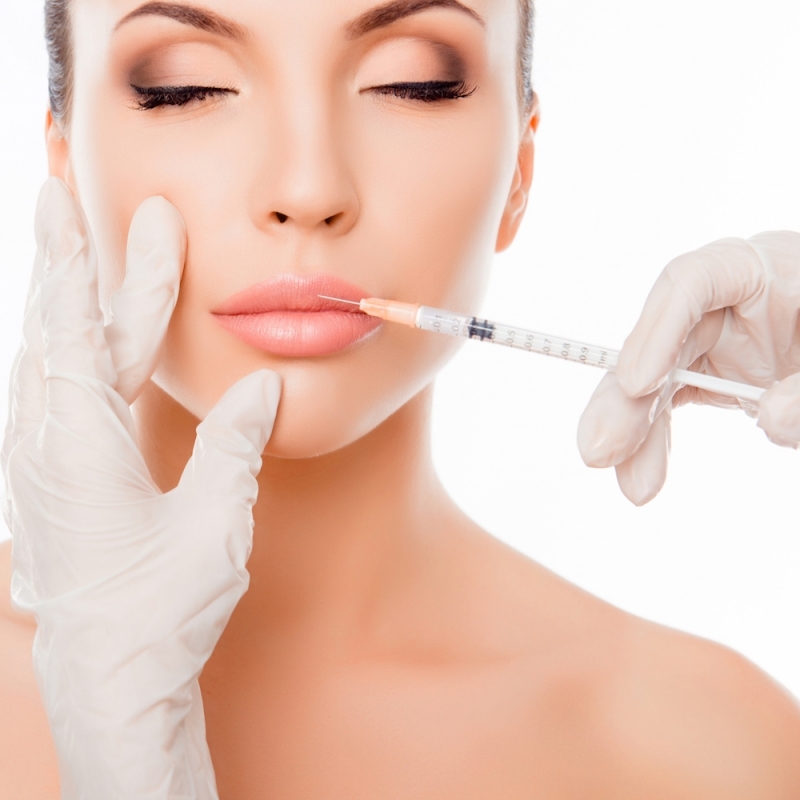 Filler injections, [e.g. Collagen, Fat, Hyaluronic Acids (Restylane®), Bovine Collagen + Polymethylmethacrylate PMMA (Artecoll®/Artefill®)] work as small amounts of a substance are injected into the skin, they can add fullness, desired shape, and minimize static wrinkles, folds, and some scars. Call Dr. Roth to schedule your consultation today. Can’t Thank Dr. Roth Enough!